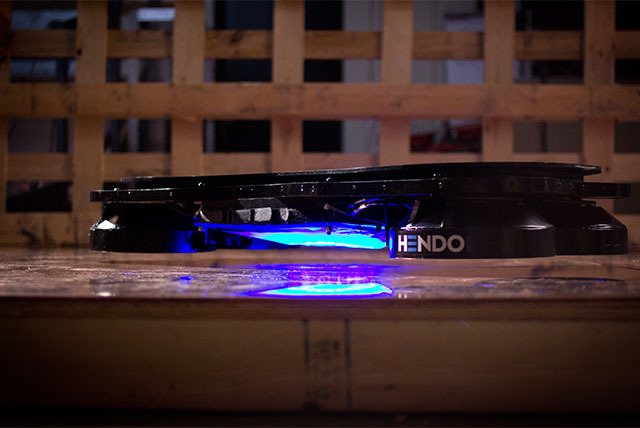 The Hendo hoverboard looks like a prop from the movie "Back to the Future Part II" -- a skateboard with no wheels that hovers about an inch off the ground for a frictionless ride. But there are no special effects here: It's real. "We can't do everything Marty can do but we're a whole lot closer than we were," Greg Henderson, Arx Pax CEO and Hendo hoverboard co-creator, told CNET. The hoverboard, currently in its prototype form, is the creation of Jill and Greg Henderson of the Californian company Arx Pax. The company uses a patented magnetic technology, which means that you're riding on a magnetic field. In its current form, the device needs a non-magnetic conductive surface, such as a copper sheet, underneath it in order to hover. In the future, the developers plam to expand beyond that, to just about any material. Arx Pax is currently raising money to begin production of the boards and to create places to ride them. "Yes, we're going to have hoverboards, we're going to have hover parks, we're going to have hover luges and hover roller coasters," Henderson said. As of Wednesday, Oct. 22, the company had received pledges on Kickstarter to cover more than its $250,000 fundraising goal. The first ten hoverboards were available for preorder until recently for $10,000 each, but they have been sold out by now. The company is also selling Whitebox™ Developer Kits containing the hover engine starting at $299 each on Kickstarter. Describing how a kit works, Henderson explained, "It can move frictionless, and something you've never seen before -- bounce in air." Henderson hopes to harness the hoverboard's ability to load weight onto the so-called "hover engine" to apply it to a vast range of uses beyond recreation. He said that the technology could one day be used to hold buildings aloft during earthquakes or floods. "Why not a building, why not a house, why not an operating room, why not an expensive piece of equipment or a precious piece of art?" Henderson mused. The company has updated the hoverboard more than 20 times but there's still more tweaking to be done to lower the noise level and incorporate a remote control. Henderson aims to have the design ready for production in October 2015.